Papergreat: Friends & family recipes scrawled inside "Joy of Cooking"
Friends & family recipes scrawled inside "Joy of Cooking"
During one of the many, many waves of cleaning out the house on Oak Crest Lane earlier this decade, it was determined that the battered kitchen copy of Joy of Cooking wasn't going to make the cut for keeping. If you're familiar with it, you know it's a hefty tome and it's far from unique or rare. Plus, at that point, we still had approximately one zillion of Mom's other cookbooks in the Keep pile. So it was out with Joy. But before we discarded it, I tore out the first few pages and added them to a manila folder filled with food ephemera [hoarding alert]. On those pages, as oft happens with cookbooks, some extra recipes had been scrawled over the years. And, given the handwriting in our family tree, I do mean scrawled. 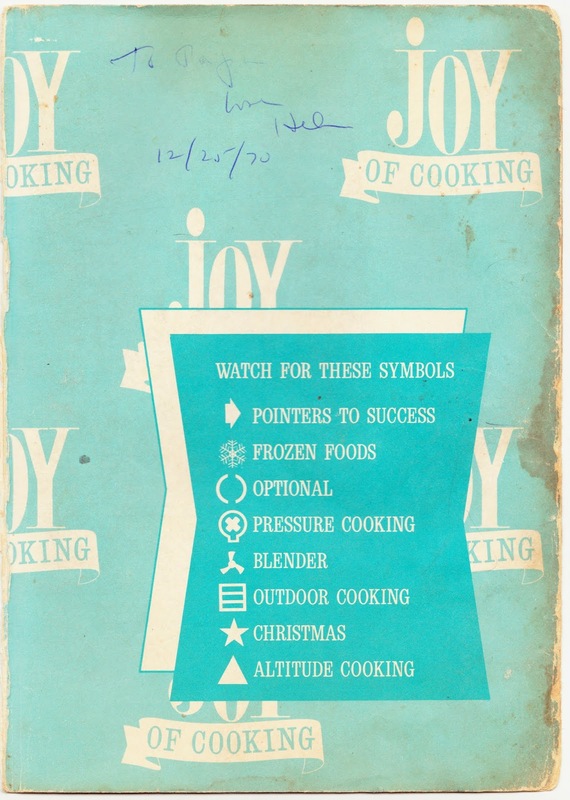 Shown above is the cookbook's first page, and we see that this copy of Joy of Cooking was originally gifted to Papa, from Helen, on Christmas 1970. Papa is my great-grandfather, Howard Horsey Adams (1892-1985), who was the top chef on Oak Crest Lane. Helen is his daughter (and my grandmother), Helen Chandler Adams Ingham, who was once at Stonehenge. Add the shrimp soup and evaporated milk together and heat. Then add the shrimp, mushrooms and scallops. Last, add sherry and pour over dried noodles. Heat butter in skillet & put in casserole. Put rice bottom of pan. Stir in almonds, lay chicken on rice. Heat soups together & H2O in separate pot & then add sherry. Pour over chicken, sprinkle cheese. Bake uncovered for 3 hours, 275° & put foil over when getting dry. Do day before & put in refrigerator. Put cooled soup over & cover & let some air in. 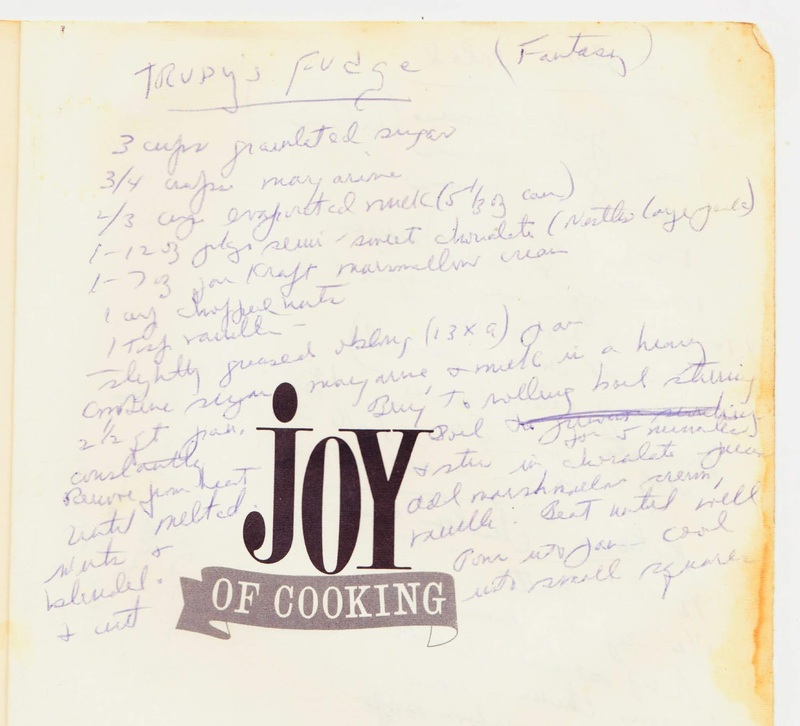 Finally, here's the recipe for Trudy's Fudge (Fantasy), if you want to translate it yourself and service your sweet tooth.